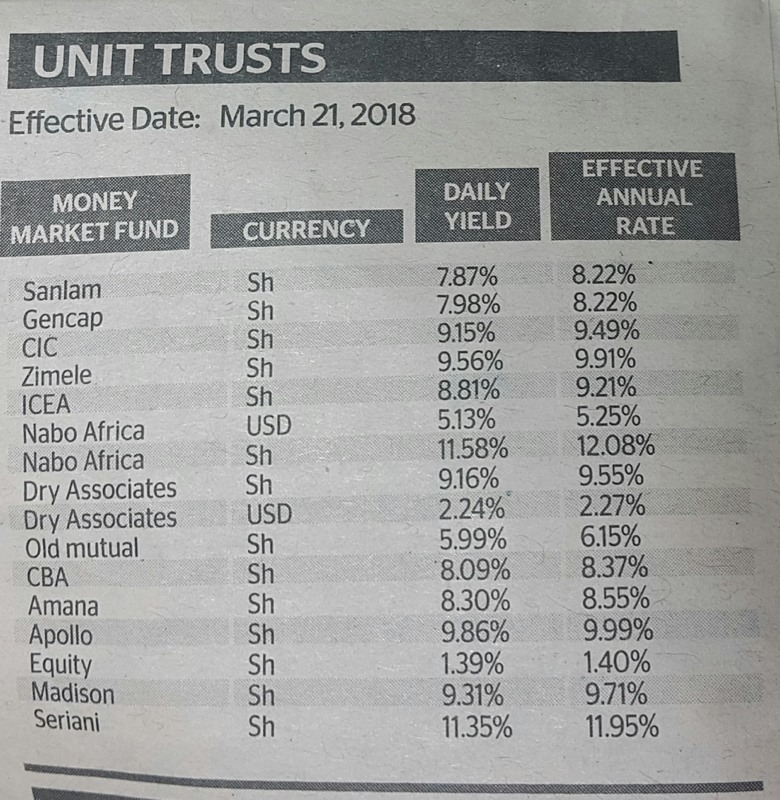 There is a guy who was pitching for their diversified investments across the region somewhere in Wazua.Put you email addr heer and will send you his contact when I get it.Should you get him,tell us the finer details of that MMF..
Has anyone used the Nabo Money Market Fund? Seems the best according to the Business Daily comparison of peers. However they don't pick calls or answer emails. Some units are giving as high as 12%, then e=Equity goes ahed to give 1%.....!? About that Nabo MMF..a minimum of Ksh 1M is required. 1% surely...ama ni per day? Gencap?? I haven't received a cent since the Chase closure!! @Chaka the guy is myself, wazua elder since 2009. Indeed Nabo have the highest MMF return at 12.5% and returns on equity fund at 91% from inception 2 years ago. Hi @sparkly, Kindly drop me a mail on wmakanga at gmail dot com (no spaces). I would like to do some biz with that Nabo MMF. in taxation policies outside Kenya can raise or lower return. constraints on liquidity and the repatriation of funds"
How wide is the variation from the advertised 12.5%? and is the 12.5% the highest limit of this variation? Currently considering Sanlam investment and need some advise on the difference between the trusts. Those that have first hand information on dealing with the company your views are hight welcome. @Winmak I trust you were satisfied with the response. Anyone else wishing to get more info can drop me a text or call on 0708733938. I have decided to go with CBA MMF. I have seen an alarmist post that mentions Nakumatt,Dubai Bank,Chase,Family,Ecobank,Sanlam.Is all well at Sanlam? Boss CD gani hii offering 12%. Bank?